We saw nine in the last Lorien Legacies book, now this is the back story of number nine and how the Mogs arrested him. 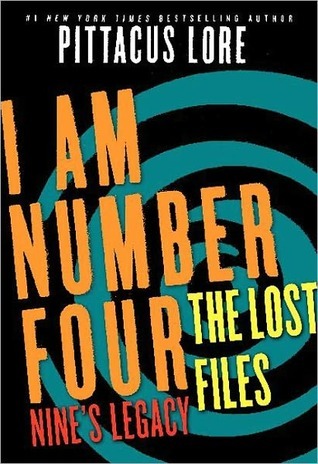 Presenting Lorien Legacies #2.5 I am Number Four: The Lost Files : Nine's Legacy by Pittacus Lore. This short novella is all about number nine. We first saw nine in the second book, the power of six, there he was imprisoned by the mogs and was rescued by John/four and Sam. Nine's Legacy is all about how his imprisonment came about and why he is so ferocious, reckless and ready to fight back. Nine's Legacy is about number nine/Stuart, who is in Chicago with is Cepan, Sandor hunting down Mogadorians. We see him go through all the vices of a human life, fall in love, rebel against your guardian, do all you can to impress your significant other and elders etc. He is definitely an interesting character and so different from the other numbers alive. Nine's story is far more different that John/Four or Six's. He lusts after Mogadorian hunting while his Cepan Sandor loves Gadgets. But he rebels against his guardian for he is tired of hiding, an attitude which bears it consequences leading to his capture. Out of all the Lorien Legacies books so far this is by the most different of them all and shows us in plain light what your actions can do if you take the wrong route. "Nine's Legacy has more or less prepared me for whats to come in the next book, the rise of nine." I haven't read this series. I've been really wary of it since the movie, but I'm thinking that's about to change....irrevocably!